Boot Inn Boot, Holmrook, CUMBRIA, CA19 1TG, 019467 23224. Longrigg Green Eskdale CA19 1TW Tel.019467 23201. Old Brantrake Eskdale, CA19 1TT Tel. 019467 23340. Whin Rigg Eskdale CA19 1UA Tel. 01946723217. St Michaels Nook Muncaster Country Guest House, Ravenglass CA18 1RD Tel.01229 717693. Fisherground Farm Holidays Eskdale Green, CA19 1TF, Tel. 01946-723349. Hollins Farm camp site Boot, Eskdale. 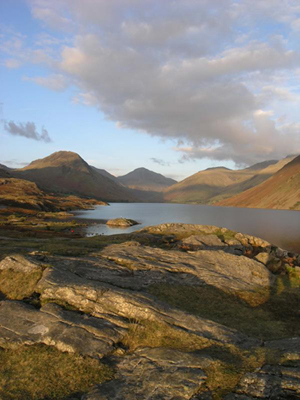 Eric Robson quite rightly praised on Twitter this view he took of Wastwater in 2012. Eskdale Show, now held near the King George Inn, last Saturday in September. 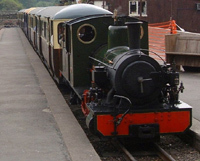 Laal Ratty steam powered railway into the dale, great for the kids and adults. www.owls.org The World of Owls and falconry at Muncaster Castle.